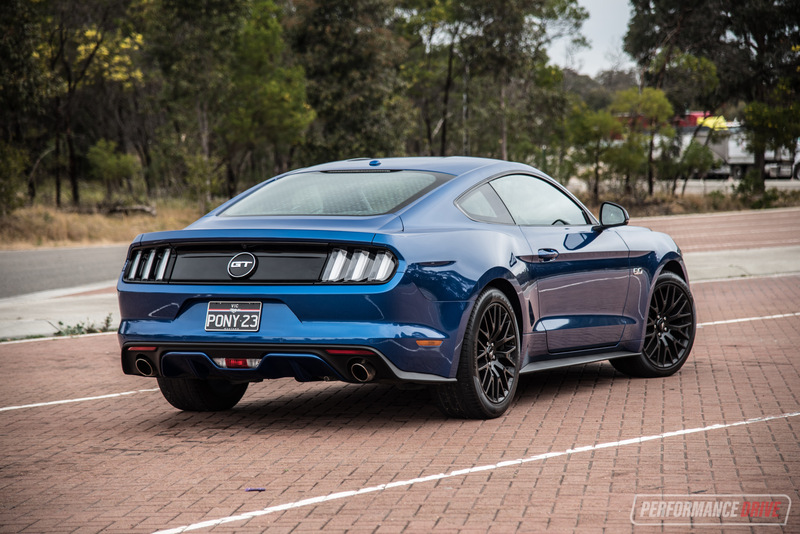 PerformanceDrive has finally got its hands on the 2017 Ford Mustang GT, the American legend with staggering pent-up demand that hasn’t waned since its 2015 launch. This is unusual for a sports car, whose sales typically enjoy an initial spike, followed by a steady decline – note Toyota 86/Subaru BRZ. 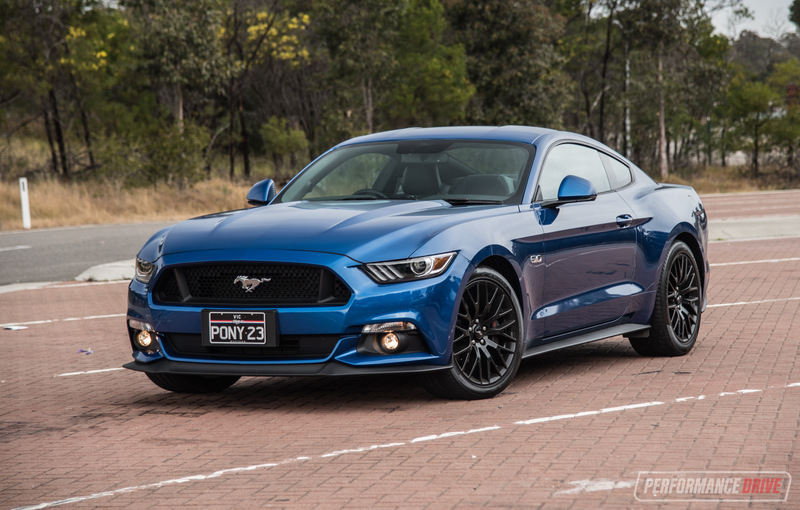 In fact, demand for the Mustang is growing, with 5967 local sales to the end of July compared with 3118 this time last year. This is in spite of the two-star ANCAP controversy, which we’ll expand upon later. Is the hype justified? 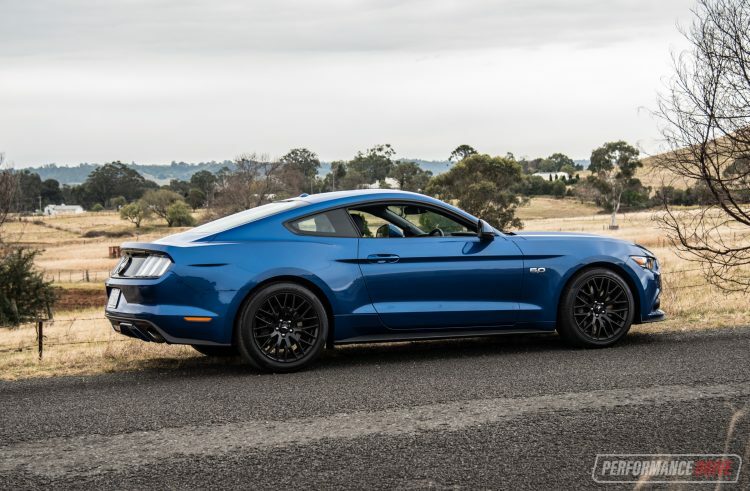 Is the Mustang a worthy substitute for bereaved Falcon fans licking their wounds? And does it have the quality and finesse of a modern sports car? 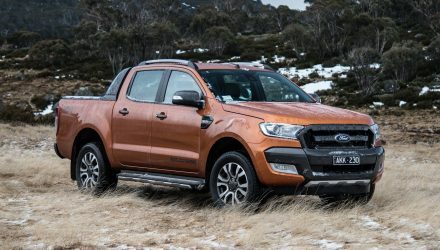 There’s no mistaking its iconic design, which combines elements of the celebrated 1960s fastbacks with Ford’s newest Kinetic 2.0 design language. 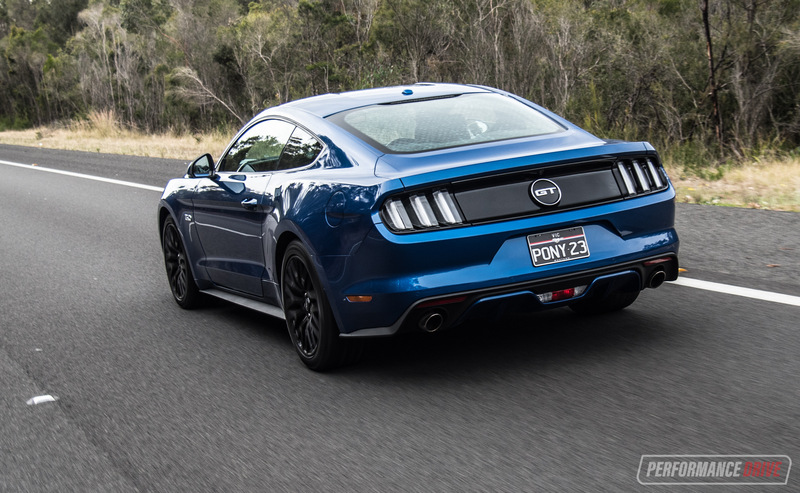 Considering Ford knew the Mustang was expanding into new marketplaces, it did a great job of keeping its flavour and delivering a special-looking car. 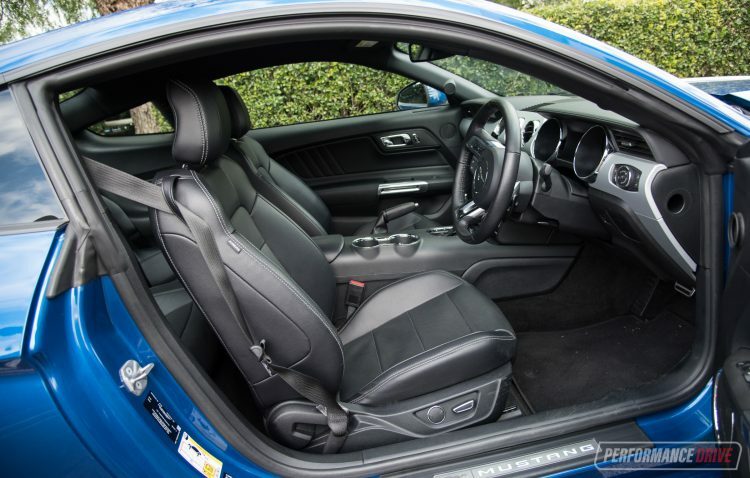 The width and large car feel of the Mustang will make those stepping from an Aussie muscle car feel right at home, but at 4784mm long and on a 2720mm wheelbase, it is a 2+2 seater, with the back seats for temporary use only. The sloping roofline severely impedes rear headroom, which probably isn’t an issue for the convertible (when roof is down). 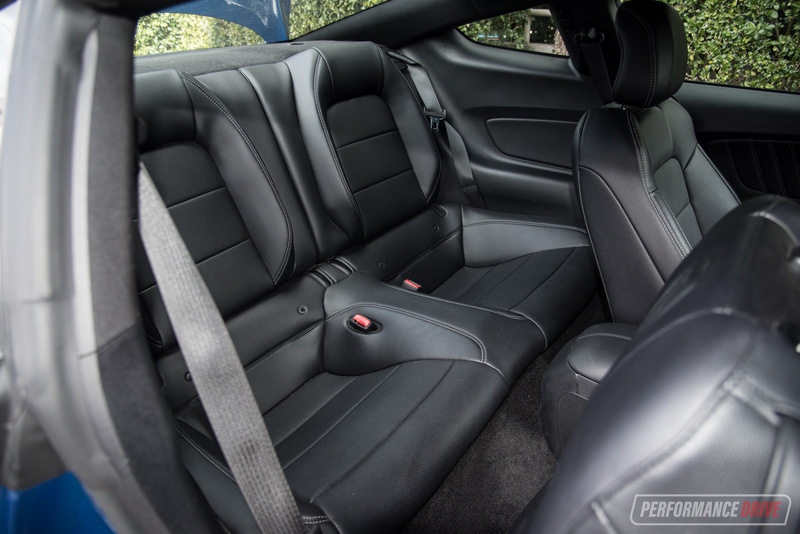 The thickness of the front seats, with no scalloping, doesn’t help matters here either. 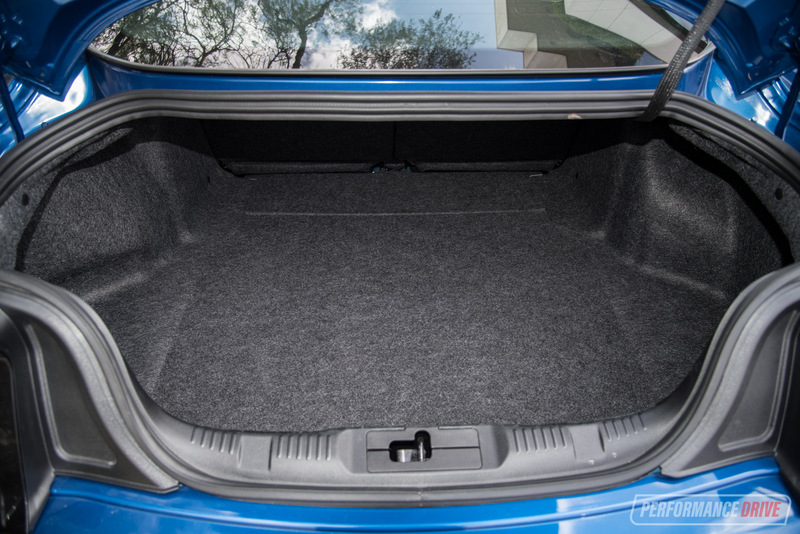 Boot space is a decent 408 litres, but the presence of an inflator kit in lieu of a spare tyre is a bit cynical. 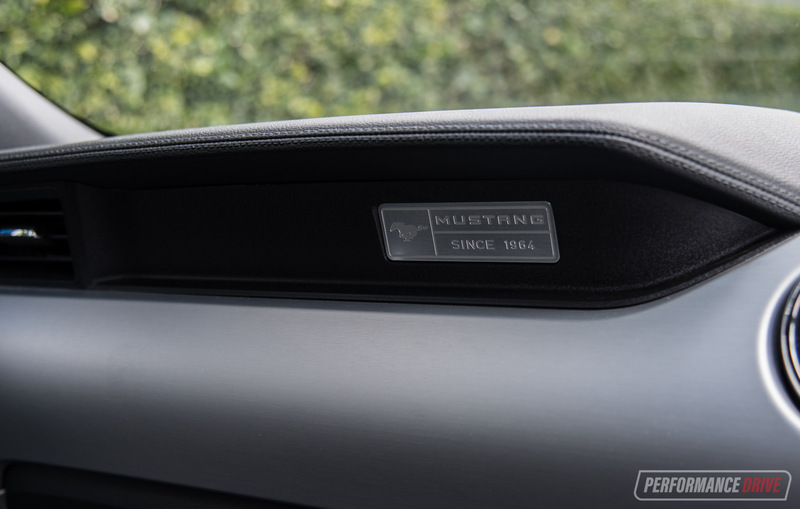 Front occupants are well catered for in the space and comfort department, with seats that include electrically adjustable cushion and lumbar support, but a lever-operated backrest for some reason. Like the exterior, the interior mixes classic design elements with some modernity. The brushed alloy panel with circular vents and twin-cowl dash are retro touches, as are the chrome toggle switches at the bottom of the centre stack. 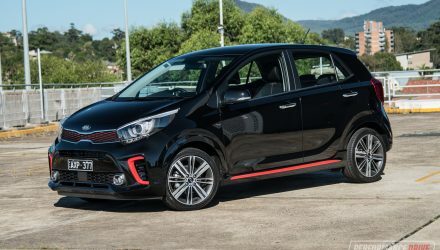 Overall quality is fairly low for a car with this price tag, with most surfaces put together crudely and with cheap plastics. 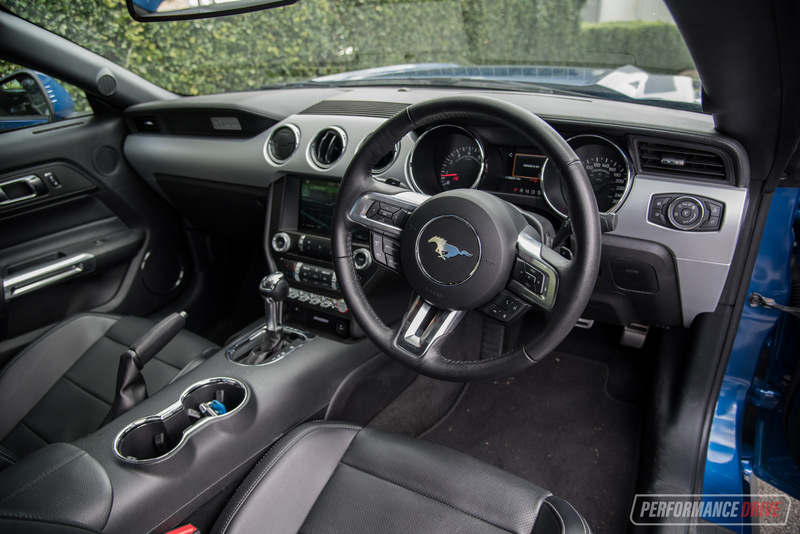 Climate control and radio are both easy to operate with buttons and switches supplementing all controls in the Ford Sync 3 infotainment system with the large touch-screen. 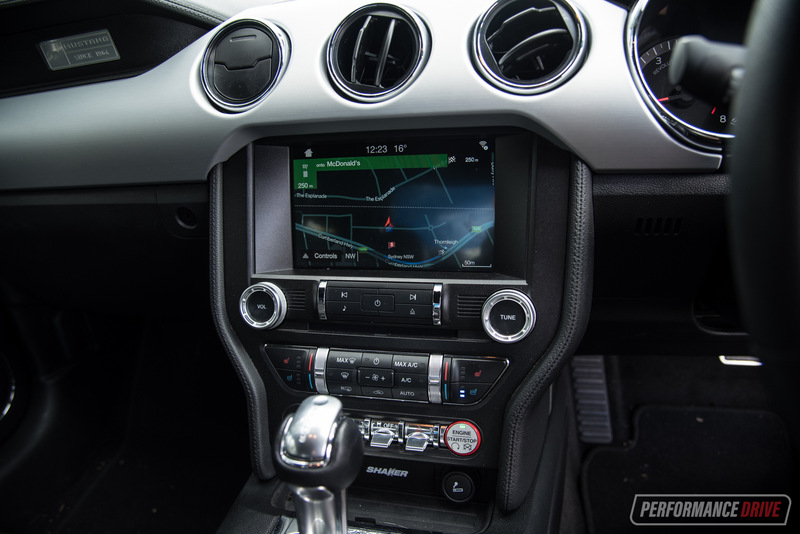 The new QNX-based infotainment system is a step forward over Ford’s previous version, with less complicated graphics and easier menu navigation. 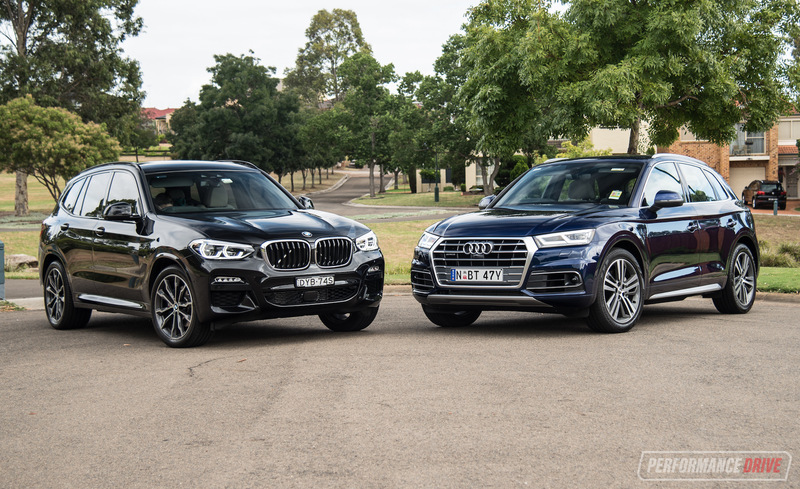 But it is still behind the market standards in terms of overall functionality and refinement. 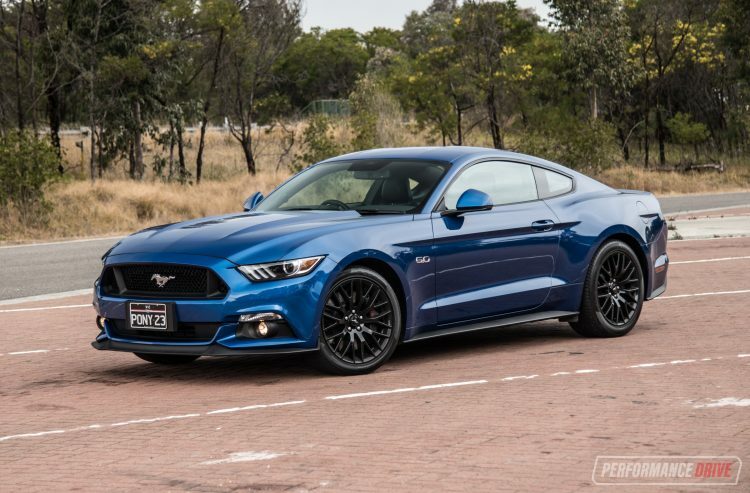 Voice control is as good as we’ve come to expect form Ford, for all functions. 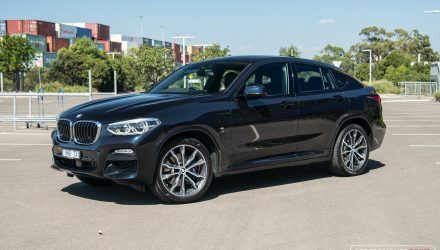 Some other areas that need work include a navigation system that forgets your input when you engage smartphone mirroring, and a navigation system that is more vocal about speed cameras than getting you on path. There’s also the handbrake on the passenger side, no digital speedometer and poor side mirror visibility. Now to the elephant in the room; the two-star ANCAP rating. This isn’t as cut-and-dry as you might think. 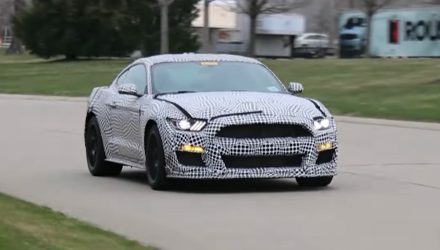 In terms of structure, the Mustang is quite sound, with front occupants scoring either ‘good’ or ‘acceptable’ ratings in front, pole and frontal offset tests. There is a slight risk of whiplash, however. Pedestrians and rear passengers don’t fare so well, reinforcing the notion that this is a 2+2 sports car. 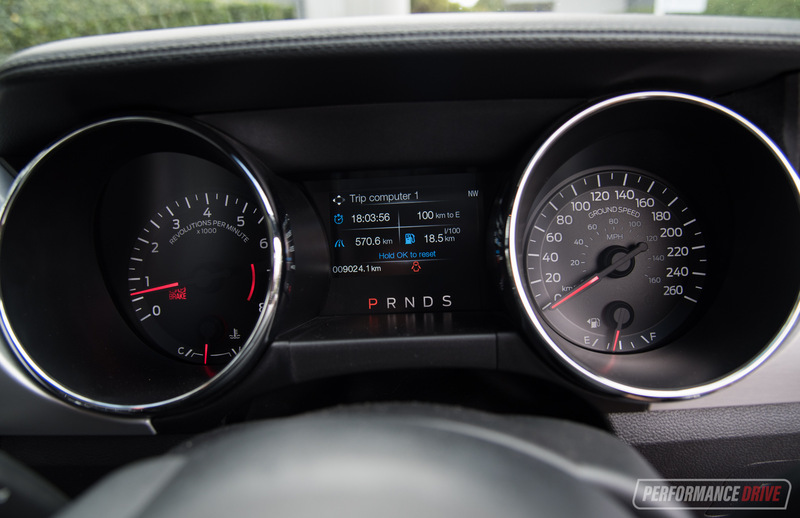 The reason for the dismal score can be attributed to new ANCAP regulations that require active safety features such as autonomous emergency braking and lane departure warning. 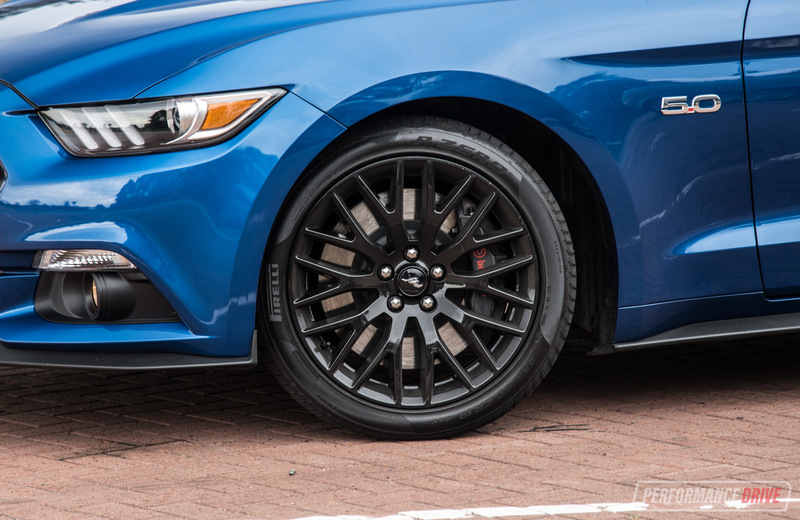 The 2018 Mustang will bring these, for a bump up to three stars, but the rear occupant woes will not be addressed until the 2020 replacement. You can read the full ANCAP report here. Now for the exciting part. 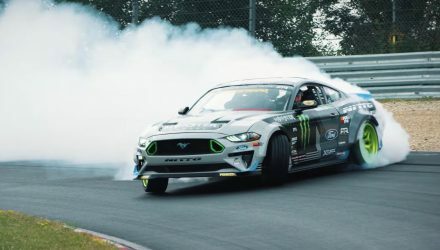 With all the videos on the internet of Mustang drivers losing control and ploughing into hedges, you could be forgiven for thinking it is a crude, blunt instrument. 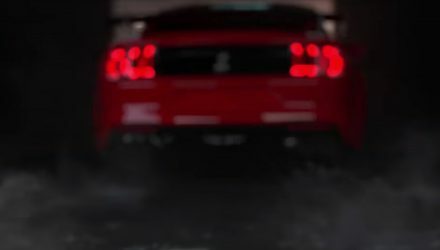 Most of those videos are of the previous-gen S197, with a solid rear axle. 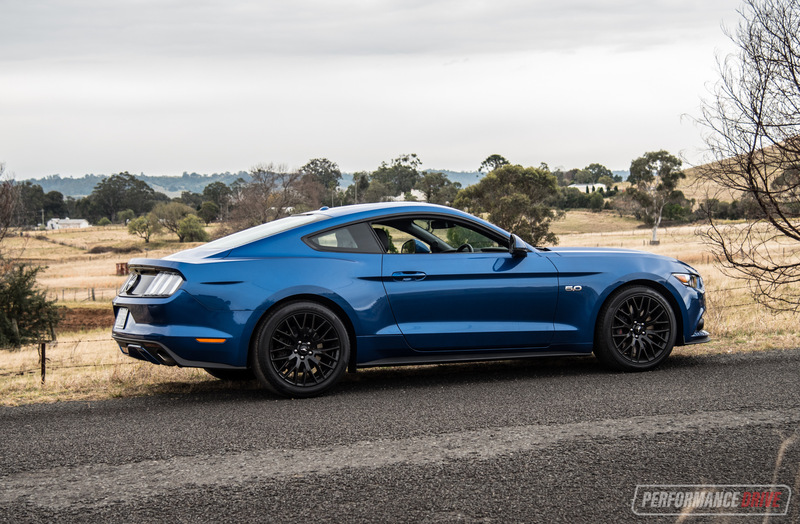 This new S550 has a more rigid chassis, a sophisticated independent rear suspension and is therefore a different, more civilised animal. Having said that, those not accustomed to dealing with powerful muscle cars should exercise caution exploring the car’s limits. 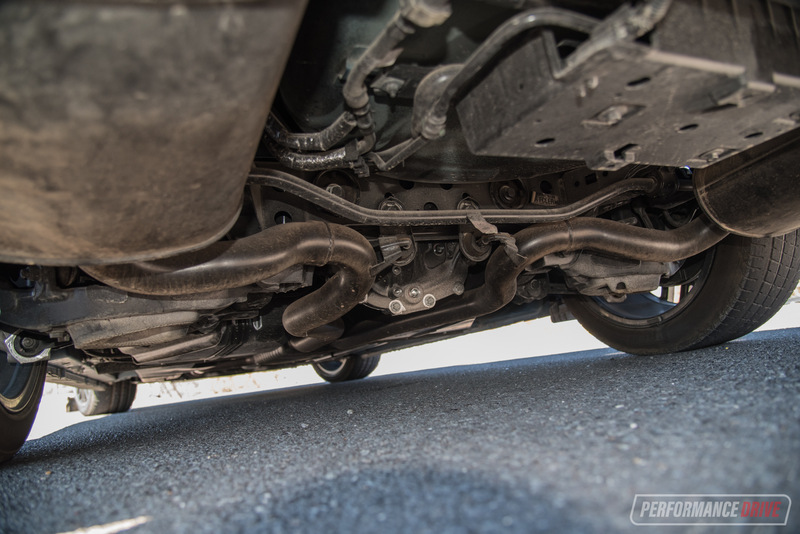 Although it is forgiving and progressive when the rear end does give away, it can still catch inexperienced driver’s unaware, with a looser stability control safety net than, say, a Commodore SS V. It must be said, however, that our test example had over 8000 hard, media-driven kilometres on its clock, explaining the worn rear Pirelli P-Zeros. 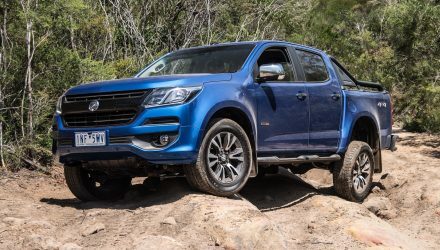 The chassis is eager and more balanced than you might expect of a muscle car, without falling into the pin sharp realms as this is a 1700kg vehicle after all. 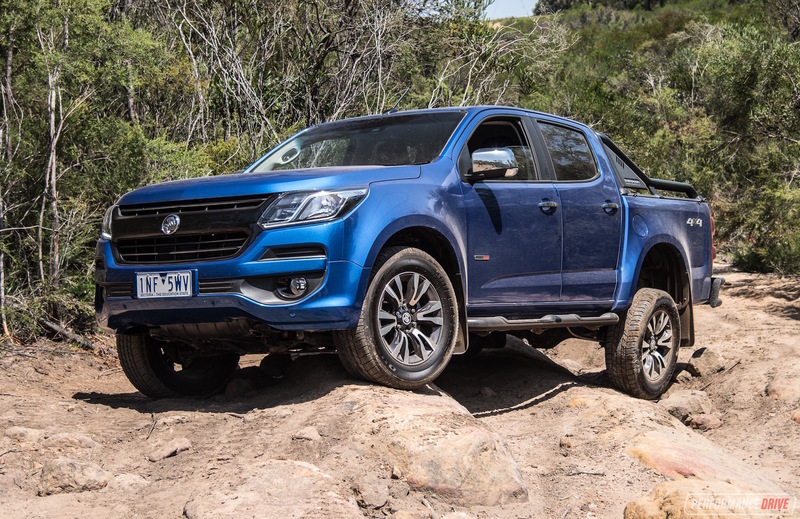 But it is adjustable and predictable, and certainly a lot of fun down your favourite country road. Actually, it’s a lot of fun no matter where you drive it. It has the ability to turn a regular drive into a joyful event. Putting a smile on your face every time. 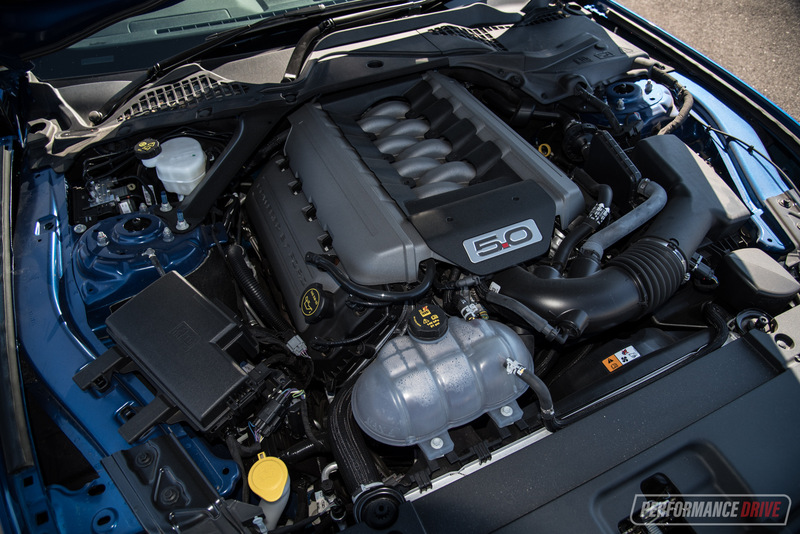 The noise from the quad-cam 5.0-litre ‘Coyote’ V8 is rich, burbly and intoxicating. 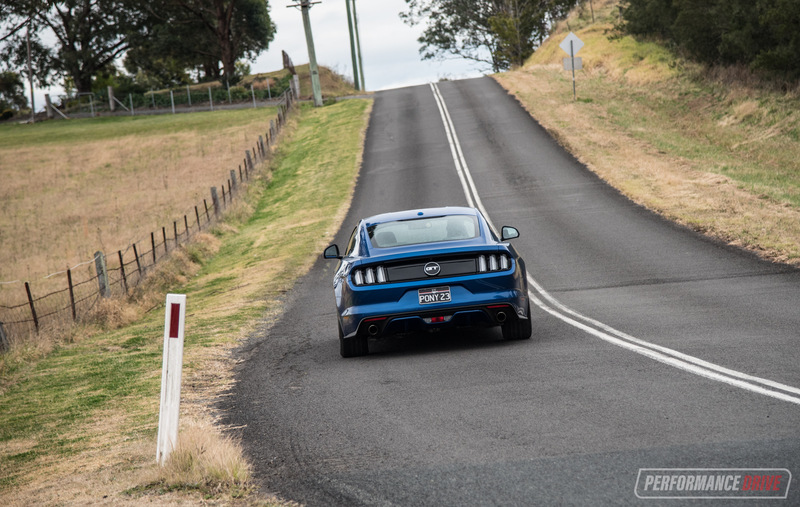 It is a heroic, quintessentially Mustang element that the 2.3-litre-engined car misses out on.The engine also loves to rev, surprisingly high for an American V8. 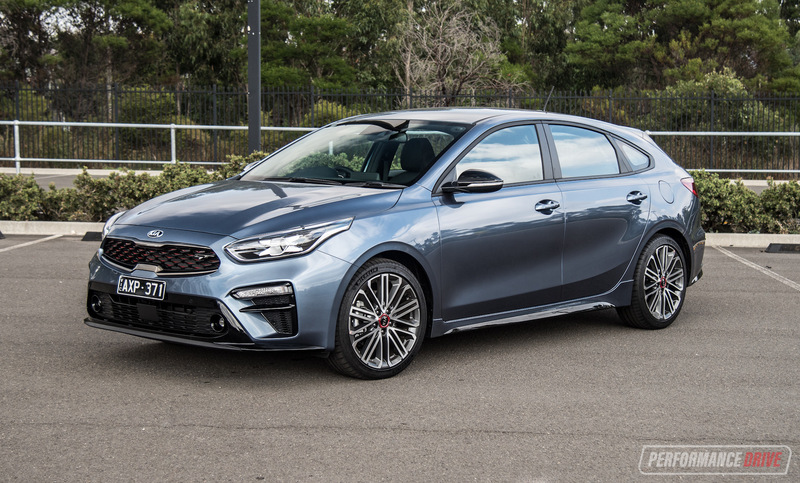 We would’ve liked a bit more overrun perhaps, and a bit more volume, but there are myriad aftermarket and tuning options around. Fuel economy is quoted at 12.6L/100km. 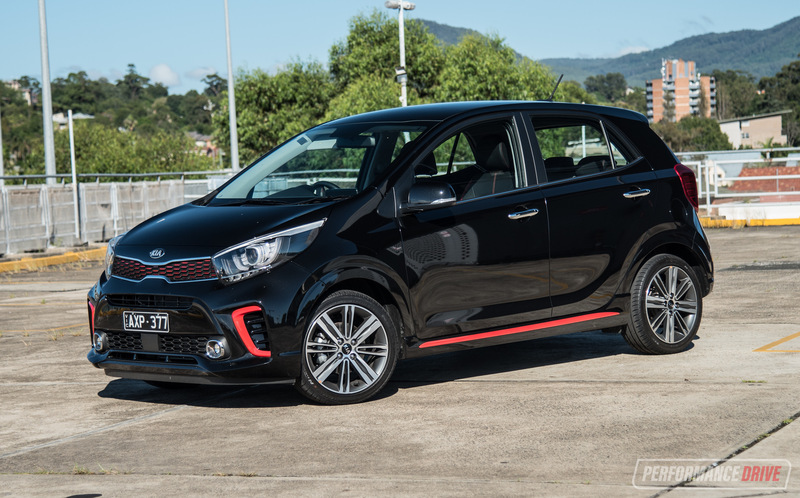 In hard, urban driving, we hovered around the 19 mark, with that figure dropping down into the 8s for effortless freeway cruising, with an overall average of about 14L/100km. 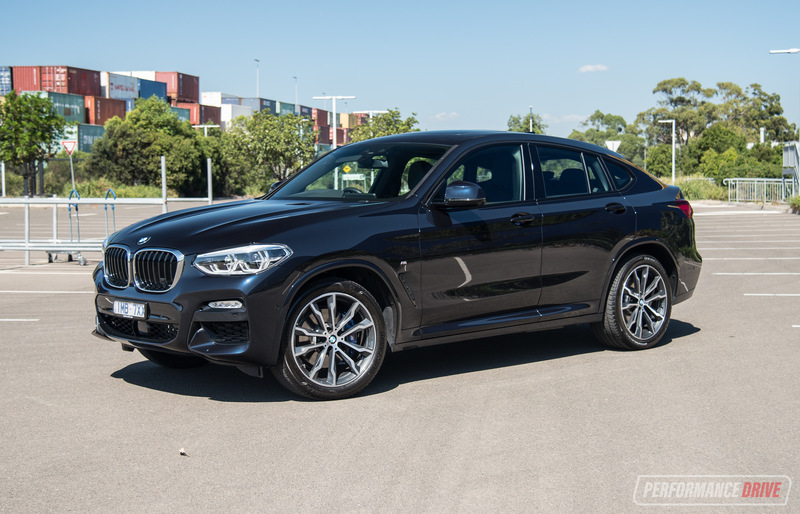 The 2018 model will bring a ten-speed automatic and revised engine which should improve things noticeably. 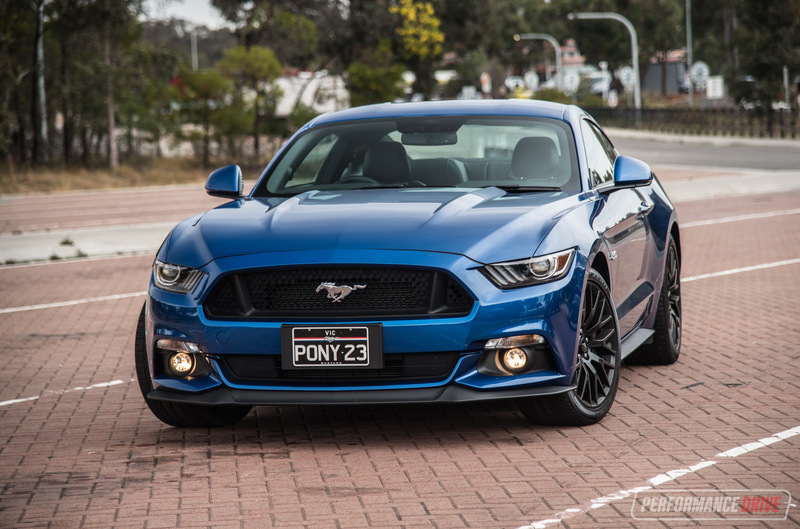 The Ford Mustang has a story and heritage almost unmatched in the automotive world. That Australia was denied it for so long has no doubt added to its mystique and gone a long way towards explaining its sales success here. It’s a car that makes you smile, makes people approach you in awe, and in a lot of situations, is liveable as an everyday car. 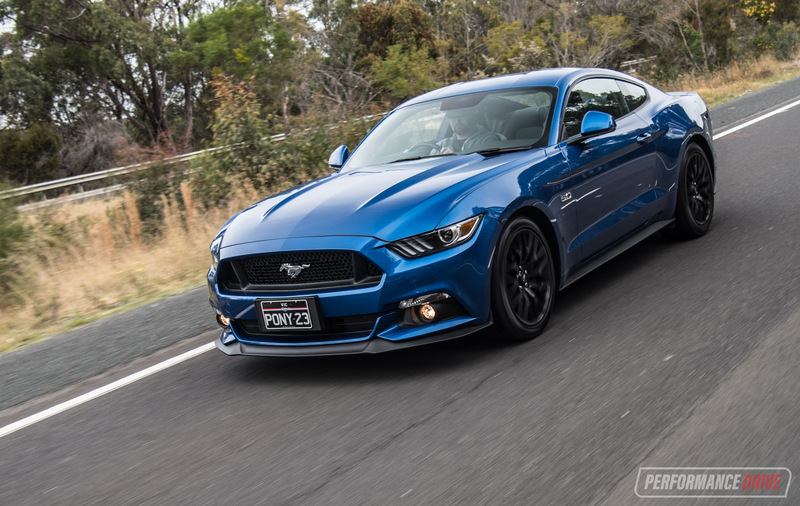 We are happy to report that despite some of the minor flaws mentioned, it’s an exciting and well-rounded muscle car that oozes old school charm in an age of increasingly sanitised cars that wrap you in cotton wool. 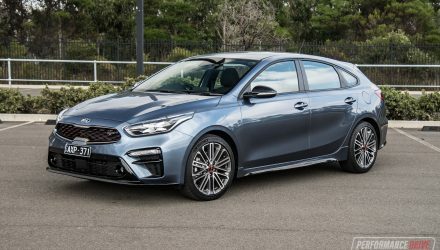 If active safety and fuel economy are important considerations, it’s worth waiting for the 2018 model. 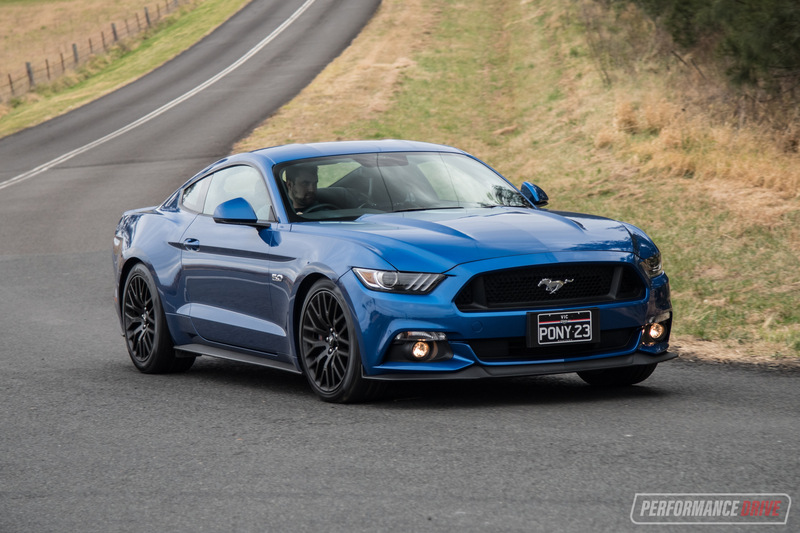 But come October when Holden throws in the towel in this game, the Mustang will be the default choice for affordable V8 muscle.